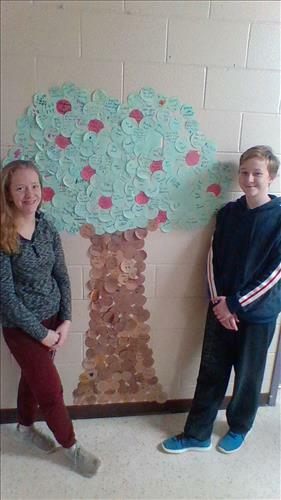 In the spirit of inclusiveness, the student government at Courtland Public School wanted to create a visual display that could serve as a reminder to students every day to be positive and kind towards everyone. So Student Prime Minister Zoey, shortly after she was elected, started thinking about how to incorporate the idea of trees and the concept of growth at school. She came up with an idea that led to this unique project. Inspired by this theme, the student council planned an activity that utilized the school’s cross-grade colour house groups, and got them to write positive messages on small circles of paper. The positive messages kept coming, and the team used these circles to create a tree in the main hallway. Once every student and teacher had written a message, the tree began to grow and take shape. Well-Being is one of six indicators of Grand Erie’s Multi-Year Plan, and projects such as this one help promote enabling environments that recognize the well-being of emotion and spirit, allowing students to participate fully in their educations. The tree is a living display, and the hope is that students, parents, and visitors to the school will add messages. This way, the tree will continue to grow as messages are added and their wonderful sentiments spread to everyone who passes by.